Adam E. Grutzmacher has combined his lifelong belief in social justice with his passion for trial advocacy. He champions the causes of individuals who suffer injuries due to the negligence of others. Adam earned a degree in political science from Moravian College and a Juris Doctorate (J.D.) from Widener University School of Law. While at Widener he accomplished the rare feat of becoming a member of both the Moot Court Honor Society and the Moe Levine Trial Advocacy Honor Society. Adam is currently the Senior Associate at the law firm of Clearfield and Kofsky where he has been successfully litigating personal injury cases since 2005. He is permitted to practice in Pennsylvania and New Jersey state courts as well as before the federal court of the Eastern District of Pennsylvania and the District of New Jersey. 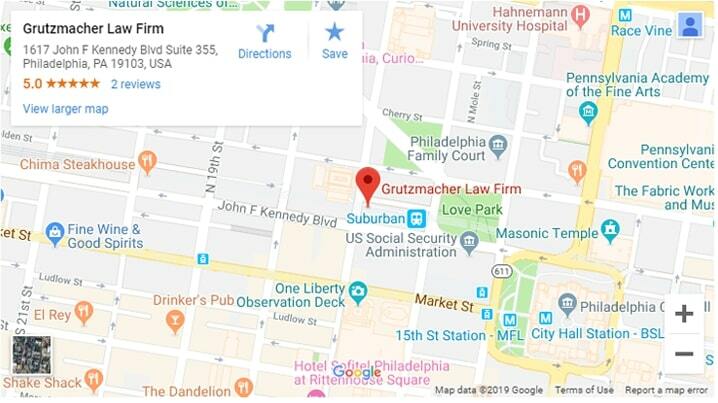 Adam is also an active member of the Philadelphia and Pennsylvania Bar Association and the Pennsylvania Association of Justice. In his free time, Adam enjoys watching sports, rowing, cooking, wine collecting and spending time with his wife and two daughters. Adam represented a wrongful death claim related to the Market Street building collapse in 2013. The collapse destroyed a Salvation Army thrift store, killing 7 people and injuring 11. The civil case settled for a record $227 million. This is the largest civil settlement in Pennsylvania history. Before the civil case, a criminal trial took place, ending in the conviction of the contractor and excavator in charge of the construction. “No amount of money can bring any of these victims back,” said Adam after the announcement of the settlement. However, there is a silver lining: The case has drawn public attention to the dangers of negligent construction and construction defects. Additionally, the Salvation Army donated the land where the thrift store once stood. It will be used as a memorial for the victims of the tragedy.